UFC on FX 2 Alves vs Kampmann Fight Pick | MMA Fighting Events Videos Techniques UFC Fight Picks and News. Thiago Alves previously earned a title shot versus George St. Pierre by racking up 7 win in a row in the UFC. During that run he beat the who's who in the welterweight division with wins versus fighters such as Josh Koscheck, Matt Hughes, and Chris Lytle. 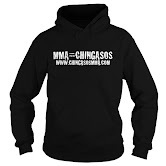 Unfortunately for Alves, he lost his title shot, and then lost again at the hands at Jon Fitch. Since then he's 2-1 and needs another solid win to get back into title shot consideration. Martin Kampmann also has some solid wins in the UFC but has had mixed success lately. He's coming off a win where he beat Rick Story via unanimous decision, but is only 3-3 in has last six UFC fights. His last three losses have come at the hands of Diego Sanchez, Jake Shields and Paul Daley. 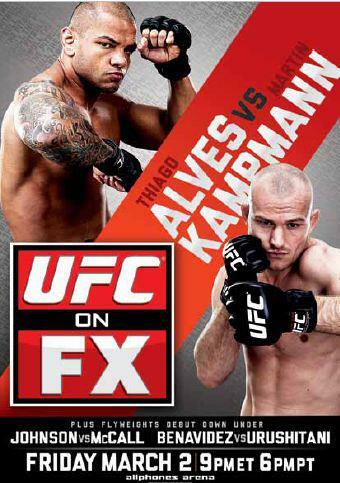 Thiago Alves is a better stand up fighter than those three fighters, so it will be a tough match up for Kampmann. My official fight pick for UFC on FX 2 is Thiago Alves. He's fought tougher competition, and has better stand up than Kampmann. Alves will be able to keep the fight standing and will land harder more powerful strikes throughout the fight, possibly finishing with a TKO.